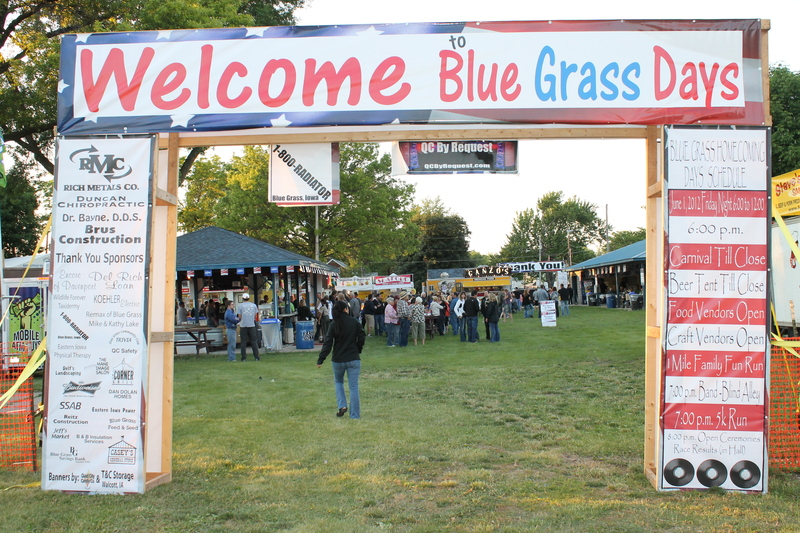 The Blue Grass Community Club is once again planning our annual Blue Grass Homecoming Days to be held on June 7th and 8th in the Blue Grass Community Club Park. Because of the support of our generous sponsors for this annual celebration, our not-for-profit organization is able to continue giving back to our local and surrounding communities with the profits raised. We are asking you to consider sponsoring one of our many Blue Grass Homecoming Days activities listed below. If you are unable to sponsor at this time, please consider a monetary donation that may also be used to raise funds. To become a sponsor for 2019 Blue Grass Homecoming Days, please contact Tina Kress at (563) 343-2004 or Becky Guy at (563) 340-3195. You may also download the Sponsorship Agreement Form at the bottom of this page and mail it to the address provided. Please send payment no later than May 15, 2019 to guarantee your name on the back of the race and sponsorship t-shirts. Together, we can make this another successful celebration. Bronze Individual Sponsor = $25 or less Multiple Sponsorship’s Avail.